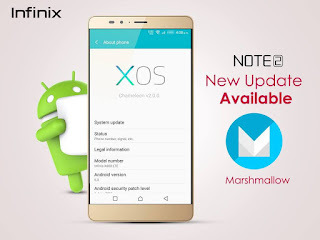 Finally, Infinix has officially released the XOS update for both infinix zero 3 and infinix note2 users. Infinix mobility announced couple of days ago that they will be releasing their new XOS update for some of their devices. So if you happen to be a Zero 3 or note 2 user then congratulations to you. The new XOS is an upgrade to infinix XUI. But unlike the XUI which is based on Android 5.1 lollipop version, the new XOS is based on Android version 6.0 Marshmallow. Aside the OS Upgrade, the new XOS also comes with some new cool features which will be listed below. ==> Based on ANDROID 6.0 marshmallow. ==> New single layer desktop. ==> Redesigned pull-down notification bar. You can now customise shortcut icons to display in any order. ==> Added weather plug-in for convenient updates. ==> Added XHide to protect your private information. ==> Optimized system stability and performance. Make sure you check your phone's build no under "about device" in your phone settings before downloading as flashing the wrong firmware can brick your device. Sp Flashtools Version: Download Here. => Sp Flashtools Version: Download Here. => Tcard Version: Download Here. If you are probably new to the whole OS Upgrade procedure. Then you can check out detailed guide on how to upgrade via Tcard hereand also how to upgrade via sp flashtools here. >> Check your phones build no(under settings>>about phone) before downloading and make sure you download the right version. >> Make sure you don't interrupt the download or shake the cable while your phone is upgrading. >> Do not turn off your PC until the upgrade has completed successfully. Failure to follow the instructions correctly might lead to your device getting bricked.. But not to worry you can easily unbrick it. So if you mistakenly brick your device while trying to upgrade it then leave your complaint in the comment box below and i will try to help out. If you have any question, feel fee to ask and don't forget to subscribe for more updates. Pls what is the meaning of sport24 version and tcard version. My phone don't have memory card. Can I update with phone memory only. And I have never upgraded the phone before, can I upgrade straight into marshmallow version? Pls what is the meaning of spflash version and tcard version. My phone don't have memory card. Can I update with phone memory only. And I have never upgraded the phone before, can I upgrade straight into marshmallow version?